I love the very idea of a hiker boxes, and of course the huge help they can be to the hiker who needs more food, or who forgot or lost some gear. Recently I re-supplied my son Daniel and his two buddies, who are hiking the John Muir Trail, near the trail’s midpoint at Edison Lake. Right outside the Vermillion Valley Resort café/store stood two hiker boxes—one for food and one for gear. 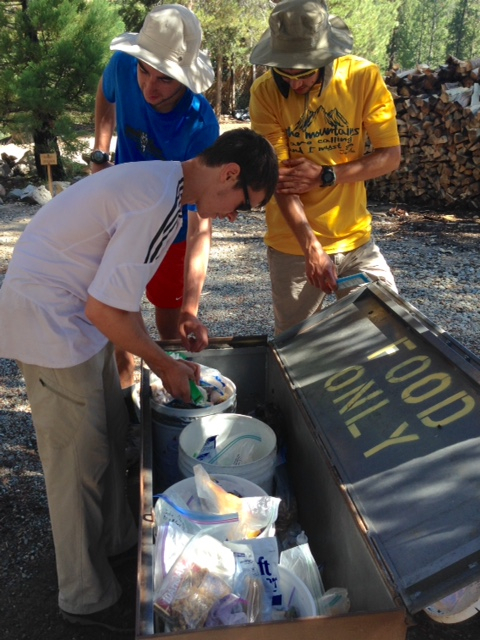 I was pleased to observe hikers adding to the hiker boxes and taking what they needed. There were smiles all around—on the faces of the hikers who gave and on the hikers who received. John Muir Trail hikers are pretty happy to find these hiker boxes at Vermillion Valley Resort, located near the midpoint of the trail. By definition a hiker box is a box you find located along a long-distance trail where you can leave or take supplies. 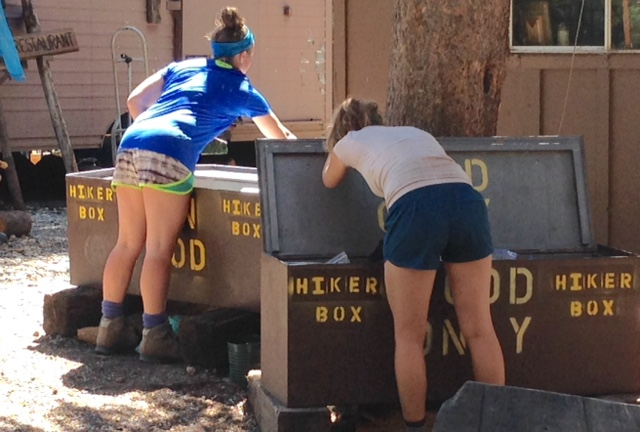 Hiker boxes can be found at backcountry stores or other businesses, lodges, outfitters or volunteer organizations. 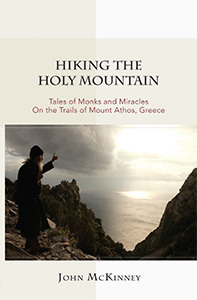 • Food, often left when a hiker tires of eating something or bought and brought more than needed. At Vermillion Valley Resort, the hiker box with the food contained everything from the very healthiest of vegetarian backpacking dinners to cans of Spam, plus lots of granola and trail mix. And who knew there could be so many different kinds of just-add-water meals with rice or noodles? “What looks good for dinner?” This Hiker Box along the John Muir Trail was full of foodstuffs ranging from candy bars to $10 freeze-dried meals. The hiker box with gear held lots of bottles of biodegradable soap, bandannas, and blister kits. Clothing for the taking included hiking shorts, fleece pullovers and a sports bra. As I watched the happy JMT hikers add and take items from the hiker boxes, it occurred to me that sharing is what hiking is all about. 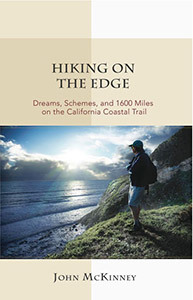 In this time when so many people are disconnected from the great outdoors, it’s certainly a perfect time for hikers to share the joy of hiking with the many who hike and the many more who do not what it means to be a hiker. 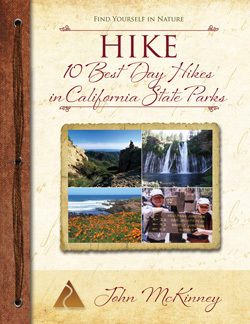 Let’s share with our trail companions the health and wellness benefits of hiking. Let’s share with friends and family members that wonderful perspective on the natural world gained by walking through it at two or three miles an hour. And when we hikers have an extra bottle of mosquito repellant, a freeze-dried beef stroganoff dinner or a trekking pole, let’s be sure to share and leave it in the hiker box for the next hiker who comes along.